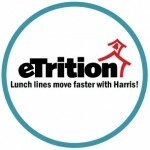 Harris School Solutions is proud to announce that Centerville Public Schools in Sand Coulee, MT, has chosen to upgrade to eTrition, a cloud-based Child Nutrition solution. The district, which operates one cafeteria with two meal-serving lines, is a long-time user of the Meal Tracker system, also from Harris. Centerville is eager to gain better efficiency in its point of sale operations, as well as more robust reporting capabilities. The district is excited to bring parents online, while increasing operational efficiency by having access to its data in the cloud.